One of the best strategies to address the demand for health care professionals in the United States is to make full use and increase the number of nurses practicing at the advanced level. Advanced practice registered nurses (APRNs) include nurse practitioners, clinical nurse specialists, and certified nurse midwives. In the State of Indiana, scope-of-practice regulations affect not only the growth of the profession statewide but also the ability of APRNs to meet the population’s needs. A move to full prescriptive authority will be a step up from the current status where APRNs must establish and maintain collaborative agreements with physicians to prescribe medications. Nurse practitioners can bring much-needed relief to medically underserved areas where there’s a worrying shortage of primary care physicians. However, limitations on the services they can provide prove to be a disadvantage to these populations. In spite of the shortcomings of the scope of practice (SOP) for advanced practice nurses, nurse practitioners have improved access to care by establishing their own practices and diagnosing and treating patients, especially in rural communities where there is a shortage of physicians. Through extensive training, usually at the graduate level, nurse practitioners and other advanced practice registered nurses have the competency to treat physical and mental conditions through physical exams, evaluation of medical histories, and ordering and interpreting diagnostic tests. The graduate program, a master’ degree in nursing or doctor in nursing practice, prepares the student for practice and the pre-certification exam. With no immediate solution for the physician shortage, the importance of nurse practitioners in the delivery of care cannot be overstated. They are a vital link in the delivery of care to populations who would not otherwise have access to a healthcare professional. The fact that they’re cost effective, and the level of patient satisfaction is higher or as high as that delivered by a physician proves to be icing on the cake. The Master of Science in Nursing program is one of two educational paths for nurses to prepare for advanced practice registered nursing. The program is designed to deliver an expansive knowledge base and clinical learning opportunities to prepare for specialization and/or general practice. Though there are several specialization options, the core courses are the same across the board. Students can expect to learn health assessment, nursing research, evidence-based practice, health promotion, health education, disease prevention, diagnostic techniques, and health problems across the lifespan. Accredited programs will deliver a curriculum that ascribes to the American Association of Colleges of Nursing’s, The Essentials of Master’s Education in Nursing as well as the competencies required for certification by the respective certifying organizations. Program graduates will be eligible to apply for certification by the credentialing body for the area of specialty. Students learn the impact of culture, policy, and economics in practice. They develop leadership, management, communication and advocacy skills as these complement their heightened clinical competencies. On the clinical end, graduates will understand the legal and ethical guidelines, standards of practice, and policies and regulations related to their chosen specialty area of practice. The discernment to use information technology to manage and transform data, design interventions to achieve quality outcomes, embrace collaborative practice within the interdisciplinary context, apply the results of research findings to solve clinical problems, and engage in lifelong learning activities are some other outcomes of the MSN degree. The master’s degree in nursing can prepare registered nurses for practice in various categories of advanced practice – nurse practitioner, nurse midwife, and clinical nurse specialist. The prevailing shortage of primary care physicians is partially responsible for the popularity of nurse practitioner programs as students grasp the opportunity to meet public demands for primary care. Nurse practitioner programs are further divided into smaller specialty areas that address certain populations, such as psychiatric-mental health, family nurse practitioner, adult-gerontology primary care, and adult-gerontology acute care. Nurse educator and nurse leadership specialty tracks are also in demand as students recognize an urgent need for educators and leaders. Students will be required to complete 42 to 62 credits including 600 to 1000 hours of clinical experiences to prepare for the specialty role and graduate from the program. The delivery format is usually designed with the working nurse in mind. Online, hybrid and traditional formats may be available for convenience and flexibility. RN to MSN: Upward mobility RN to MSN programs let students enroll in graduate level courses while they complete the requirements for the BSN. Graduates will receive the BSN and MSN credential at the conclusion of the program and will be prepared to take a national certification exam in their area of specialty. 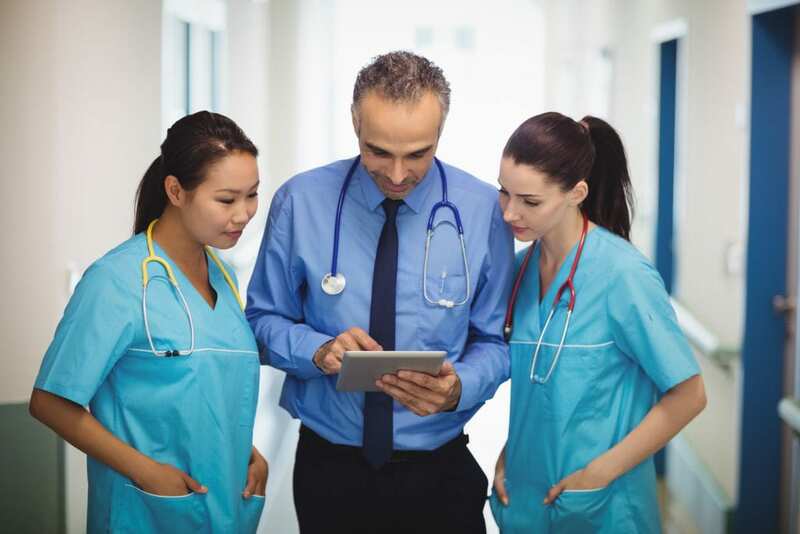 Direct Entry MSN: The direct entry MSN program is designed for registered nurses who want to prepare for a specialty role with an emphasis on a population focus. Students expand on their knowledge of sciences, nursing and care gained in the undergraduate program. Graduates are eligible to sit a national certifying exam in their area of specialty to apply for licensure in an advanced practice role. Post-Master’s Certificate: To enroll in a post-master’s certificate program, you must already have a master of science in nursing. The curriculum is designed to create an individualized plan of study based on the student’s educational background, experience, and goals. The requirements and options also depend on previous coursework, but students will be required to complete at least 12 credits to earn the certificate. Graduates may have the option to sit a national exam for the new specialty role. A baccalaureate degree in nursing from a regionally accredited program. A registered nurse who holds a baccalaureate degree in a non-nursing discipline may be eligible after completing some additional criteria. Proof that all nursing licenses are unencumbered. Letters of professional reference from college professors, work supervisors, or professional colleagues. Official transcripts from the institution that granted the baccalaureate degree. No license exists for nurse practitioners or clinical nurse specialists in Indiana. However, to prescribe, administer, or procure prescription medications in practice, you must apply for Prescriptive Authority. To practice as a Certified Nurse Midwife, you must apply for limited licensure. All applicants must have a valid and unencumbered registered license and submit to a criminal background check. The Board will provide instructions for completing the fingerprinting and criminal background check after receiving a completed application and fee. No license exists for practice as a nurse practitioner or clinical nurse specialist in Indiana. NPs and CNSs can submit an application for the authority to prescribe independently as an advanced practice nurse. Fill out, sign, and mail the completed application to the Indiana Professional Licensing Agency. Enclose a passport-sized photo of approximately 2 ½ x 3 ½ inches of your head and shoulders. Sign the front of the photograph. Include the non-refundable application fee of $50. Make personal check, cashier’s check or money order payable to the Indiana Professional Licensing Agency. Include a marriage license or divorce degree or any other documentation of legal name change if your name on the application differs from that on your documents. Provide a copy of your current, unencumbered license to practice as a registered nurse in Indiana or another compact state. You may apply for prescriptive authority while applying for a registered nurse license in Indiana, but you must write “Pending Indiana Licensure” on the application. Request official transcript indication successful completion of a graduate program at an accredited college or university. All official transcripts must be mailed directly to the IPLA. If you graduated from a bachelor’s degree program, you can apply for PA as long you submit proof of current national certification. Provide documentation of your successful completion of a graduate course in pharmacology that covered at least semester credit hours at an accredited university. The pharmacology course must have been completed within five years of the application date. If the completion date was more than five years, you must submit proof of completing at least 30 contact hours of continuing education, including 8 contact hours of pharmacology, within two years of the application date and proof of prescriptive experience from another jurisdiction gained within 5 years of the application date. A full statement of details, including violation, date, location and disposition if you answer “yes” to the history questions on page three of the application. In case of malpractice, provide the name of the plaintiff. If you’re licensed to practice in another state, submit verification of licensure. The licensing agency must send confirmation directly to the Board of Nursing. After the Board receives your application, they’ll send instructions for the fingerprinting process to complete a criminal history background check. Indicate whether the collaborative practice agreement is new or a replacement for an existing agreement or addition to an existing one. It must include your name, home, and business address, and telephone number and that of the Licensed Practitioner, all offices and practice locations where you’ll prescribe, your specialty or board certifications and that of the Licensed Practitioner, and the specific manner of the collaboration. It should also include the time and manner the Licensed Practitioner will review your prescribing practices, documentation of prescribing practices with at least a five percent random sampling of charts and medications prescribed for patients, a list of all other written collaborative agreements (both you and the practitioner), and the duration of the agreement. The agreement must have your original signature and that of the Licensed Practitioner. A Collaborative Agreement template is available on the IPLA’s website. If you plan to administer, dispense or procure controlled substances in your advanced practice, you must apply for an Indiana controlled substances registration (CSR). Send in your CSR application alone or with your prescriptive authority application. Enclose the application fee of $60. Obtain a federal Drug Enforcement Administration (DEA) registration. Information regarding registration is available on the DEA’s website. Supply an Indiana practice address. One valid CSR will let you prescribe controlled substances throughout the state. A Certified Nurse Midwife is a registered nurse who has graduated from a nationally accredited school of midwifery, passed the American College of Nurse-Midwives’ National Certifying Examination, and is licensed by the IPLA to practice as a nurse-midwife. If you’ve completed the first two requirements, you must submit a completed application for limited licensure to the Board of Nursing. Submit a copy of your active, unencumbered registered nurse license. Provide official transcripts or other documentation as evidence of graduating from a nationally accredited school of midwifery. Submit proof of having successfully passed the Nationally Certifying Examination. Both prescriptive authority and limited licenses expire on October 31 of odd-numbered years. You may renew your license online or by mail within 60 days of the expiration date. If submitting by mail, send the appropriate renewal form with the fee to the Board of Nursing. If you hold prescriptive authority, you must complete at least 30 hours of continuing education including a minimum of 8 hours of pharmacology. Documentation of completing the mandatory continuing education must be submitted at the time of renewal. The continuing education program must be one approved by a nationally approved sponsor and the Board of Nursing. If you obtained prescriptive authority less than 12 months before the expiration date, you do not need to submit continuing education in the first renewal cycle. If your expiration is at least 12 months after receipt of prescriptive authority, you must complete at least 15 contact hours of continuing education including at least four hours of pharmacology.